Families ate sushi and pizza after the Hillel Arts Showcase Saturday evening. Haleigh Whisted/Mitzpeh. 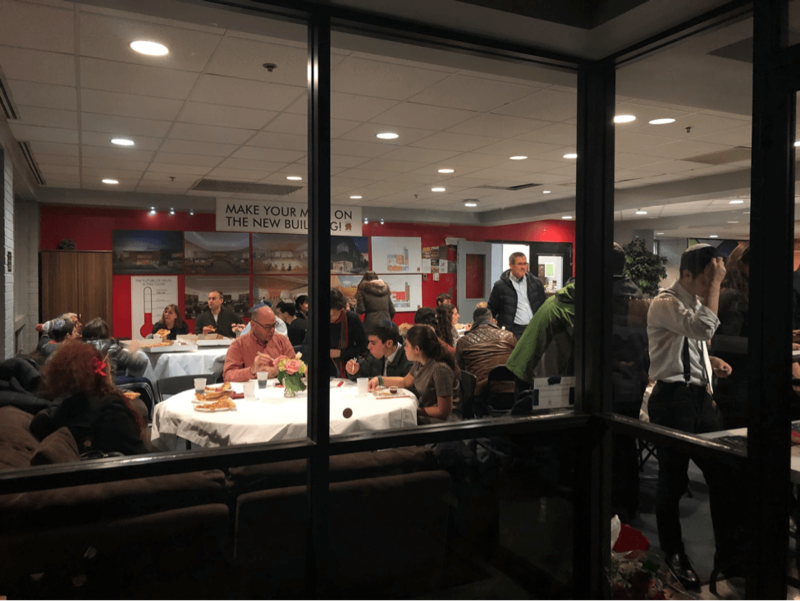 The annual Hillel family weekend at this university included various events, meals and activities that catered to the university’s Jewish community Friday night. Rashel Maikhor, the Hillel development associate, explained that the primary reason Maryland Hillel hosts a separate family weekend from this university’s family weekend is the conflicting timing of the regular annual weekend for some parents. Every year, family weekend is scheduled near the Jewish High Holidays, making it difficult for some observant parents and relatives to visit. Hillel decided to create this family weekend to accommodate the large population of traditional Jewish families affiliated with this university. Ron Reisler, who has a daughter at this university, said that he enjoys experiencing the weekend with other parents who have kids in the Hillel community. Reisler is one of many who find it difficult to attend the regular family weekend and appreciates a weekend that caters to the observant families. Maikhor said that the schedule caters to people who observe Shabbat, which traditionally includes dinner with family, resting and connecting with family and friends. Shabbat begins Friday evening and ends Saturday evening. Hillel family weekend ends Sunday morning. Hillel schedules events parallel to Shabbat so that students and families are able to enjoy parents’ weekend while still keeping their religious traditions. “It allows the weekend to be more personal and less overwhelming; I don’t feel as connected to the large overall UMD parents’ weekend,” said Sara Heckelman, a sophomore marketing and supply chain management major. Shabbat begins with a dinner on Friday evening. Hillel holds this dinner for students in the Hillel dining room on a weekly basis, but to cater to families, Hillel served food to guests under a tent outside of the Hillel building as well as the cafeteria room. Around 250 families attended this Friday for dinner, which followed a wine reception for the parents to have a meet and greet. “It is a way to allow parents to experience a Shabbat on campus and to have it through the lens of their children,” said Maikhor. On Saturday morning, parents and students attended services together followed by a Kiddish reception, which included assorted appetizers. Lunch was served after Kiddush for anyone who wanted to join. Some families chose to eat Shabbat meals on their own back at their student’s dorms or apartments. In the afternoon, some families headed over to Prince Frederick Hall for lawn and board games. Scheduled tours of campus were offered as well. Once Shabbat ended, families attended the biggest event of the weekend: the Hillel Arts Showcase, where at least 200 people were present. Hillel’s three acapella groups, Rak Shalom, Kol Sasson, and Mezumenet, as well as the Israeli Avirah dance group, performed. During the exhibition, there was a raffle and a beatboxing competition between representatives from each a capella group. Following the show, families enjoyed a pizza and sushi dinner at Hillel. A farewell brunch at the Hillel center Sunday morning ended the eventful weekend for families of the Jewish community. No Replies to "Hillel hosts weekend of events that cater to Jewish families"